Organic carbon (OC) records can provide for a crucial and direct linkage between Holocene environmental variability, fluvial sediment export and the coastal sedimentological record. The stable and radiogenic isotopic records contained within organic-carbon compounds provide a powerful tool to understanding the sources and transfer times of sediment eventually deposited in the coastal system. Furthermore, the coastal zone has a large OC storage potential and is a region of flux between terrestrial and marine organic carbon reservoirs. It therefore plays a crucial role in the global recycling of organic carbon, a key driving factor in atmospheric CO2 levels and, thus, long-term climate. 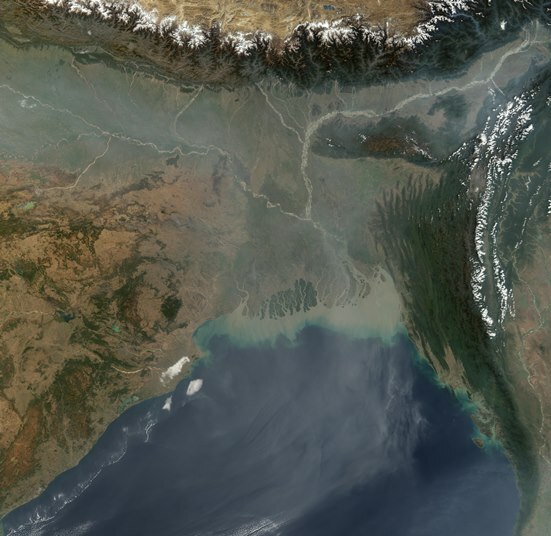 We are currently studying the bulk and compound-specific records of OC exported from the Ganges and Brahmaputra rivers (the largest sedimentary system on earth) to understand climate-driven variability in basin-integrated sediment supply and its likely feedback effects on the global carbon cycle. Overview: We are using compound-specific stable-isotope (δ13C, δD) and Δ14C measurements of long-chain n-alkanoic (fatty) acids to characterize the relationships between climate change (specifically, the strength of the Indian Monsoon) and the dynamics of sediment and terrestrial OC transfer from the Ganges-Brahmaputra rivers to the coastal Bay of Bengal over the last 20,000 years. Sub-millennial resolution records of sediment and organic carbon burial in the Bengal Fan were developed using inorganic proxies of sediment composition and delivery and paired stable isotope/radiocarbon measurements to produce reconstructions of variations in sediment provenance, monsoon strength, paleo-vegetation, OC residence time, providing insight into the relationships between climate change, geomorphic response, vascular plant biomarkers, and terrestrial OC dynamics in the Bengal Fan. Results of paleoclimatic and provenance reconstructions were published in 2017 in Earth and Planetary Science Letters; work on the implications for global carbon cycling is in prep. Overview: In this new project, we are creating a high-resolution record of bulk and compound-specific stable-isotope and Δ14C measurements from a ~20 m long sediment core that captures the last 65 years (average deposition rate of ~31 cm per year!) of sedimentation in the Bay of Bengal. By capturing the atmospheric spike in radioisotopes from nuclear weapons testing, this record provides insights into the timescales and dynamics of modern terrestrial organic carbon transfer from the Ganges-Brahmaputra river system to the Bengal Fan. Results of this work were published in 2018 in Nature Scientific Reports. Please feel free to contact us for pdf copies of any of the following publications. French, K.L., Hein, C.J., Haghipour, N., Wacker, L., Kudrass, H., Eglinton, T.I., Galy, V.V., 2018, Millennial soil retention of terrestrial organic matter deposited in the Bengal Fan, Nature Scientific Reports, v. 8, 11997, doi: 10.1038/s41598-018-30091-8. Hein, C.J., Galy, V., Galy, A., France-Lanord, C., Kudrass, H., Schwenk, T., 2017, Post-glacial climate forcing of surface processes in the Ganges-Brahamaputra river basin and implications for carbon sequestration, Earth and Planetary Science Letters, v. 478, p. 89-101, doi: 10.1016/j.epsl.2017.08.013. Galy, V., Hein, C., France-Lanord, C., Eglinton, T., 2014, The evolution of carbon signatures carried by the Ganges-Brahmaputra River system: a source-to-sink perspective, In: Bianchi, T., Allison, M., and Cai, W.-J. (eds), Biogeochemical Dynamics at Major River-Coastal Interfaces: Linkages with Global Change, Cambridge, England: Cambridge University Press, p. 353-372. Please feel free to contact us for pdf copies of any of the following abstracts or their associated presentations or posters. French, K.L., Hein, C.J., Haghipour, N., Wacker, L., Kudrass, H., Eglinton, T.I., Galy, V.V., 2018, Millennial soil retention of labile terrestrial organic matter deposited in the Bengal Fan, Goldschmidt 2018, Boston, MA, August 2018. Galy, V. Hein, C.J., Eglinton, T., 2018, Hydroclimate forcing of the terrestrial organic carbon cycle during the last deglaciation, Goldschmidt 2018, Boston, MA, August 2018. Hein, C.J., Galy, V.V., Eglinton, T.I., 2017, Post-glacial climate forcings and feedbacks of the carbon cycle in the Ganges-Brahmaputra Basin, Goldschmidt 2017, Paris, France, August 2017. Galy, V.V., French, K.L., Hein, C.J., Haghipour, N., Wacker, L., Kudrass, H., Eglinton, T.I., 2017, Compound-specific radiocarbon dating reveals the age distribution of plant-wax biomarkers exported to the Bengal Fan, AGU Fall Meeting, New Orleans, LA, December 2017. Hein, C.J., Galy, V., France-Lanord, C., Galy, A., Kudrass, H., and Peucker-Ehrenbrink, B., 2016, Post-glacial climate forcing of surface processes in the Ganges-Brahmaputra basin and implications for the global carbon cycle, AGU Fall Meeting, San Francisco, CA, December 2016. Galy, V., Hein, C.J. (presenter), Kudrass, H., Eglinton, T., Peucker-Ehrenbrink, B., 2014, INVITED, Climate forcing of the terrestrial organic carbon cycle during the last deglaciation: the Himalaya-Bengal fan example, GSA Abs. with Programs, vol. 46, no 6, abstract 248259. Hein, C.J., Galy, V., Peucker-Ehrenbrink, B., Eglinton, T.I., 2012, Climatic forcing of organic-carbon-export dynamics from the Ganges-Brahmaputra River System, Eos Transactions, AGU, Fall Meeting Suppl., Abstract B13A-0469. Galy, V., Hein, C.J., Peucker-Ehrenbrink, B., Eglinton, T.I., 2012, Dynamics of fluvial release of terrestrial organic carbon: climatic, geomorphologic or human forcing?, 5th International Workshop on Soil and Sedimentary Organic Matter: 7-11 October 2012, Zurich, Switzerland. Hein, C.J., Galy, V., Peucker-Ehrenbrink, B., Eglinton, T.I., 2012, Preliminary evidence for a monsoonal forcing of the dynamics of terrestrial organic carbon export to the Bay of Bengal, Gordon Research Conference in Organic Geochemistry: 30 July – 3 August 2012, Plymouth, NH, USA.